My office created the Criminal Justice Investment Initiative in order to use $250 million seized in international financial crime prosecutions to invest in transformative projects that will improve public safety, prevent crime, and promote a fair and efficient justice system. CJII is a first-of-its-kind effort to support innovative community projects that fill critical gaps and needs in New York City’s criminal justice infrastructure. We are focusing on efforts that will prevent criminal activity, support victims of crime, and improve diversion and reentry options. Together, these investments form a comprehensive, forward-looking approach to improving public safety for all New Yorkers. We look forward to collaborating with the many great stakeholders across New York City who work tirelessly in these areas every day. By working together and investing wisely, we can make our city safer, and our justice system fairer, in the years and decades to come. A fairer and more efficient justice system requires a bold vision, clear and focused strategies, and sustainable investment. It is built upon strong communities, safer neighborhoods, and a justice system that relies on data about what works best—from preventing crime to improving reentry of incarcerated individuals back into communities—and focuses on young people, families, victims of crime, and communities. It requires the collaboration of government agencies, nonprofit and community-based organizations, and the private and philanthropic sectors. 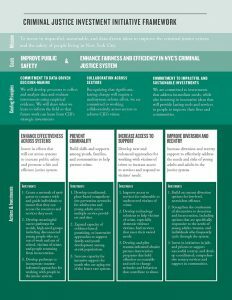 To achieve this vision, the Manhattan District Attorney’s Office established the Criminal Justice Investment Initiative (CJII), which will invest approximately $250 million in projects that will improve public safety and promote a fairer and more efficient justice system in New York City. The CJII funds are a portion of the criminal forfeiture funds obtained through settlements with international banks for violating U.S. sanctions.1 The CJII funds are specifically aimed at supporting community-based programming. The Manhattan District Attorney’s Office selected the City University of New York Institute for State and Local Governance (ISLG) through a competitive process to serve as the technical assistance consultant on CJII. ISLG provides recommendations on investment strategies to the District Attorney’s Office. ISLG manages the solicitation and contracting process, provides guidance and oversight to award recipients, and conducts performance measurement throughout the initiative. ISLG analyzed dozens of systemic factors at the neighborhood level that have an impact on crime to identify patterns and specific areas in need of investment. Data from that analysis support a geographic focus for investment in four neighborhoods in Manhattan: East Harlem, Central & West Harlem, Washington Heights, and the Lower East Side. While there are strong communities in these neighborhoods, in comparison to other areas of Manhattan the residents within these neighborhoods experience worse economic prospects (e.g., lower mean household incomes, higher likelihood of living in poverty, higher unemployment rates);3 poorer health (e.g., higher likelihood of living with HIV/AIDS, lower likelihood of having health insurance); lower educational attainment (e.g., lower likelihood of finishing high school);4 and higher rates of prison admission.5 These factors, individually and collectively, contribute to heightened violence and reduced safety in homes, schools, and communities and lead to residents’ increased involvement in the justice system. Therefore, CJII investments will focus on Manhattan, with a particular emphasis on East Harlem, Central & West Harlem, Washington Heights, and the Lower East Side. ISLG also conducted a thorough analysis of the latest research on numerous topics that affect public safety in New York City across the life cycle from birth to adulthood. Topics ranged from strengthening families in order to prevent crime, to greater access to victim services, to reentry after incarceration. In addition, ISLG solicited ideas via a public survey on its website and engaged in extensive interviews with more than 250 experts in the justice field and related fields, including academics; clinical practitioners; elected officials; representatives of local, state, and federal government agencies; and leaders from philanthropy, nonprofit, and grassroots organizations. These organizations ranged from small community-based organizations that may focus on one neighborhood or specific substantive area to large nonprofits that work across several neighborhoods and substantive areas. Based on analyses of research, neighborhood factors, and expert interviews, ISLG worked with staff from the Manhattan District Attorney’s Office to develop a series of investments for CJII. Overall, these investments seek to incorporate a number of the best practices underscored throughout ISLG’s analysis and outreach, including coordinating services to increase cooperation among service providers to better serve clients, training justice system personnel to recognize signs of trauma, ensuring access to programs and that they are effective across cultures, and encouraging providers to take a long-term view of prevention, reentry, and treatment. CJII will make these investments over the next three to five years. To ensure that CJII selects award recipients and procures services that maximize the likelihood that each initiative’s goals are met, ISLG will use a range of approaches, relying primarily, but not solely, on competitive solicitations. ISLG will make recommendations and the Manhattan District Attorney’s Office will provide final approval of award recipients who will receive funding under CJII. Performance measurement and evaluation of investments will be critical to assessing what is working well and the long-term sustainability of this initiative. Toward this end, CJII award recipients will report to ISLG on their progress over the lifetime of their awards, and as ISLG gathers data, it will share that information to ensure that experts and practitioners can learn from CJII investments. Invest in efforts that will cut across systems to increase public safety and promote a fair and efficient justice system. Cross-system efforts—including investments that address trauma, connection and access to services, and technological solutions to social challenges—will address gaps at a systemic level and link CJII initiatives together. These efforts will serve as the foundation for and support all other CJII investments, described on the following pages. Create a network of navigators to connect with and guide individuals to ensure that they can access the resources and services they need. Developing a network of navigators will promote greater use of existing resources in New York City, improve coordination and collaboration among services providers, and improve outcomes for victims of crime, youth and young adults, and people leaving incarceration. Navigators are well-trained, culturally competent peers and social workers who are mobile, connecting with individuals who have unmet service needs in the community and linking them to vital, quality services that they want or need but are not currently accessing. The navigators will work primarily on-the-go, cutting across organizations, city agencies, and systems. To better serve individuals, navigators will be recruited from the four CJII focus neighborhoods. The navigator network will create employment opportunities among people from underserved groups and communities. It will also host an educational fellowship to support career development of navigators and to build peer and social worker navigator capacity in New York City. Develop meaningful career pathways for at-risk, high-need groups including disconnected young people who are out of work and out of school, victims of crime, and people returning from incarceration. Efforts will focus on quality job training, exposure to job and entrepreneurial opportunities, employer and community support, and intensive supportive services, and they will include efforts to build the capacity of social enterprises6 to employ people from at-risk, high-need groups. Such undertakings can increase long-term, sustainable employment; improve access to employment; reduce the likelihood that youth will come into contact with the justice system;7 help reduce recidivism for individuals who have returned or are returning to communities from incarceration; and revitalize communities by focusing on economically stressed neighborhoods. Develop pathways to incorporate trauma-informed approaches for working with people in the justice system. Trauma results when an individual or community experiences a harmful or life-threatening event, series of events, or set of circumstances (e.g., violence, abuse, neglect, disaster) that has lasting negative effects on their functioning and mental, physical, social, emotional, or spiritual well-being.8 It is a widespread, damaging, and expensive public health problem that affects people of all ages, races, ethnicities, genders, and socioeconomic levels. Some of the events that cause trauma, if unaddressed, put individuals at risk of victimization or committing violence in the future, perpetuating a cycle of trauma, crime, and victimization. Although various services can help mitigate these detrimental effects of trauma, current service use among victims is low. It is particularly low among communities of color, despite the fact that young men of color experience disproportionately high rates of victimization.9 To break the cycle of trauma, crime, and victimization, trauma-informed approaches (i.e., services are delivered in a manner that is supportive to help avoid re-traumatization so that survivors can benefit from services as intended) will be emphasized across CJII investments. Investments will encourage service providers to assess and address signs of trauma and better connect survivors to services. Investments will also support the development of new treatment approaches for working with young people of color. The District Attorney’s Office is funding a $40 million comprehensive, citywide approach to transform how individuals with behavioral and mental health issues are treated at every stage of the criminal justice system. In addition, the District Attorney’s Office is investing $101 million in security and infrastructure improvements at targeted New York City Housing Authority developments, and is also investing in programs to engage residents, community groups, police, and government agencies from target neighborhoods to reduce crime and improve common spaces. Finally, the District Attorney’s Office allocated $90 million to provide every New York Police Department officer and patrol car with handheld mobile devices and tablet computers to ensure that officers in the field have access to accurate, real-time data to help them prevent and better respond to crime. Build skills and supports among youth, families, and communities to help prevent crime. Investing in efforts to prevent criminality is key to achieving public safety in the long term. The consequences of being involved in the justice system extend far beyond a single crime and can affect victims, perpetrators, their families, and neighborhoods over time. Effective interventions can prevent youth and young adults, in particular, from engaging in criminal activity and experiencing the negative consequences that result from arrest, conviction, detention or incarceration, and a criminal record. Programs that support and strengthen families and that prevent risky behavior in youth can encourage and support healthy, positive development and better life outcomes. Develop coordinated, place-based comprehensive prevention networks for adolescents and young adults across multiple service providers and sites. Youth are more likely to make use of services when the services are perceived as readily accessible.10 Coordinated, comprehensive prevention approaches can effectively prevent negative outcomes, including being involved in the justice system, by meeting young people’s holistic needs and reducing barriers to service delivery. Comprehensive supports can include, but are not limited to, mentoring, education and training, life skills, trauma treatment, mental health screening, and substance use services. By intervening early and supporting targeted, holistic development, youth become less likely to interact with the justice system and more likely to engage in pro-social activities. Expand capacity of evidence-based, promising, or innovative approaches to support family and youth development among at-risk populations. Given the amount of time children spend with their parent(s) from birth through adolescence, and the importance of healthy parent-child relationships to development,11 investing in family and child functioning can mitigate longer-term risk factors, including academic problems, antisocial behavior, and involvement in the justice system.12 Approaches that support family and youth development are effective interventions when family disruption and risk behaviors are possible or already apparent and may focus on, for example, families living in high-stress neighborhoods, families experiencing substance use and mental health challenges, families experiencing a traumatic event, families affected by incarceration, and families with limited education and/or resources. Increase capacity for intensive support for youth who are aging out of the foster care system. Approximately 900 foster youth in New York City become ineligible for services from the child welfare system every year due to aging out of care,13,14 and these youth disproportionately become involved in the criminal justice system.15 More intensive supports for those who are close to aging out or have recently aged out of the foster care system can help facilitate the transition to adulthood—for example, focusing on educational attainment, workforce training/placement, and or extended support addressing financial or other needs. Alongside the CJII investments for Action 2, described above, the Manhattan District Attorney’s Office made a complementary, $7.5 million investment in 2015 to expand its youth violence prevention initiative, Saturday Night Lights, to 14 sites across Manhattan. Saturday Night Lights offers opportunities for 11- to 18-year-olds to participate in high-quality sports, dance, and fitness activities, in addition to providing academic support and comprehensive service delivery. Develop new and enhanced approaches for working with victims of crime to increase access to services and to respond to victims’ needs. Findings from ISLG’s outreach to experts revealed a number of gaps in services for victims of crime, including the need for better victim access to health care, therapy/counseling, and comprehensive, affordable legal services. CJII investments will include initiatives that connect victims of crime, especially those from underserved groups, to trauma-informed services, and that increase coordination among city agencies, nonprofit and community-based organizations, and other organizations that work with victims of crime. CJII will also invest in a strategy to address gaps in services specifically for victims of domestic violence, sexual assault, human trafficking, and child abuse. Improve access to services for vulnerable or underserved victims of crime. Vulnerable or underserved victims of crime include children exposed to domestic violence, immigrants, LGBTQ individuals, individuals who are Deaf or hard of hearing, individuals who have disabilities, and racial or ethnic minorities. Children who have been exposed to a traumatic event, including violence, can experience long-term negative effects, including risk for substance use and increased involvement in the child welfare and juvenile justice systems.16 People who are Deaf are at higher risk of experiencing abuse and victimization than their hearing counterparts,17 and Deaf victims face unique barriers to accessing services. LGBTQ individuals continue to experience discrimination and violence motivated by hate at substantially higher rates than the general population.18 Supporting greater access to services that are tailored to the needs of these and other underserved groups helps ensure more positive outcomes and reduce the detrimental effects of victimization. Develop technology solutions to help victims of crime, especially domestic violence victims, to find services that meet their varied needs. Technology has the potential to increase access to services, for example, for victims who might not seek help via traditional means. Technology solutions may enable victims as well as referral organizations to quickly and safely identify social and human services that are open, conveniently located, and relevant. For example, with greater investments in technology, victims may more easily identify organizations where staff speak a certain language or specialize in serving a particular under-resourced group (e.g., LGBTQ individuals, people with disabilities, Deaf and hard of hearing people)—increasing the likelihood that victims access and receive the services they need. Develop and pilot trauma-informed abusive partner intervention programs (APIPs) that hold offenders accountable and seek to change attitudes and behaviors that contribute to abuse. Building on best practices for work with abusive partners, the delivery of trauma-informed programming aims to increase the likelihood that abusive partners gain insight into their behavior, develop empathy for victims, accept responsibility for their actions, and engage in meaningful and sustained behavior change. Research suggests a link between the experience of childhood trauma and adversity and perpetration of future domestic violence.19 Applying research-based approaches for working with trauma victims to this work with abusive partners—many of whom have likely experienced trauma themselves—may increase participant engagement and thus maximize program effectiveness. The top priority of any CJII-funded APIP will be the safety of victims and children. Toward this end, input from victims’ advocates will be critical throughout the program. In 2015, the District Attorney’s Office developed an initiative to eliminate the backlog of untested sexual assault kits across the country. Thousands of sexual assault evidence kits remain untested nationwide. Testing sexual assault kits and eliminating this backlog would provide evidence for prosecutors to hold offenders accountable and solve crimes locally and across state lines. The initiative would also acknowledge the trauma that survivors have experienced. In addition, the District Attorney’s Office has supported an initiative to pilot Child Trauma Response Teams in collaboration with the Mayor’s Office of Criminal Justice, the New York Police Department, and Safe Horizon. These teams aim to quickly identify children who have experienced severe domestic violence to provide appropriate interventions that could help reduce the long-term traumatic effects of witnessing such violence. Finally, the District Attorney’s Office, through an international partnership with the City of London Police and the Center for Internet Security, launched a $25 million Global Cyber Alliance to address and prevent victimization from malicious cyber activity. The group is working across sectors, national borders, and legal jurisdictions to build a collaborative approach to this worldwide problem. In addition, effectively addressing the needs of individuals who frequently cycle through the justice system could prevent crime and break the cycle of incarceration. These individuals tend to be at low risk for violence, but at high risk of arrest for low-level crimes, including drug or property crimes. These people often have complex behavioral health issues that would be better addressed through more effective service engagement and delivery. Rather than continuing this cycle of re-arrest and re-incarceration, developing options that increase longer-term engagement with targeted services could more effectively meet their complex needs and improve the efficiency of the criminal justice system. Build on current diversion options for low-level, nonviolent offenses. Diversion options that, where appropriate, redirect people from arrest or prosecution to other responses in the community can more effectively address the issues that underlie criminal behavior, provide proportionate sanctions, and avoid the high costs and inefficiencies of court processing, incarceration, and their accompanying lifelong collateral consequences.27 Meaningful, community-based diversion options tailor responses to individual public safety risk and service needs. They provide responses that hold individuals accountable, provide resources for positive development, and repair harms to victims, conserving intensive and expensive court responses for more serious criminal cases. Strengthen the continuum of alternatives to detention and incarceration, including options that are specifically responsive to the needs of young adults, women, and individuals who frequently cycle through the system. Given young adults’ capacity for change and rehabilitation, meaningful, community-based alternatives to detention and incarceration that offer supportive programming and opportunities for skill-building can strengthen young adults’ success in the community, help them to avoid reoffending, prevent incarceration, and reduce the likelihood of future involvement in the justice system. Similarly, a growing body of evidence supports developing a tailored response that addresses the specific risks and needs of justice-involved women. The number of women involved in the justice system nationwide has grown at a rapid rate in recent years. Incarcerated women experience high rates of mental health and substance abuse issues28 and often have extensive histories of trauma and abuse. Justice-involved women also frequently serve as primary caregivers for their young children. Responses tailored for women can promote positive outcomes and strengthen their families. Finally, individuals who continually cycle through the criminal justice system often have chronic and persistent behavioral health issues. A tailored approach for these individuals would connect them to much needed care and seek to reduce the frequency of their arrest and incarceration. The District Attorney’s Office collaborated with the New York Police Department, the Center for Court Innovation, and the Brooklyn District Attorney’s Office to launch Project Reset, an early intervention diversion program in which 16- and 17-year-old young adults arrested for non-violent misdemeanors are held accountable for their actions by participating in counseling or youth court. In addition, the District Attorney’s Office worked in partnership with the New York City Mayor’s Office to launch a $14 million supervised release initiative that will reduce the use of jail by enabling judges to allow defendants to be supervised in the community and remain with their families while awaiting trial. Finally, the District Attorney’s Office is enhancing components of drug court—including creating mental health teams, developing overdose prevention efforts, and creating an advisory board—to increase the effectiveness of the court. With these investments, the Criminal Justice Investment Initiative aims to improve public safety in Manhattan and enhance the fairness and efficiency of the city’s justice system. Through this four-point action plan—to invest in efforts that cut across systems; that build skills and supports among youth, families, and communities; that develop new approaches to respond to the needs of victims of crime; and that effectively address the needs and risks of individuals in the criminal justice system—CJII seeks to achieve its vision of safer neighborhoods and stronger communities.